August | 2011 | Satisfice, Inc.
Medical devices often undergo design improvement during development, with evolution and refinement during lifecycles extending from early research through investigational use, initial marketing of the approved or cleared product, and on to later approved or cleared commercial device versions. For new medical devices, as well as for significant changes to marketed devices, clinical development is marked by the following three stages: the exploratory (first-in-human, feasibility) stage, the pivotal stage (determines the safety and effectiveness of the device), and the postmarket stage (design improvement, better understanding of device safety and effectiveness and development of new intended uses). While these stages can be distinguished, it is important to point out that device development can be an ongoing, iterative process, requiring additional exploratory and pivotal studies as new information is gained and new intended uses are developed. Insights obtained late in development (e.g., from a pivotal study) can raise the need for additional studies, including clinical or non-clinical. This section focuses on the importance of the exploratory work (in non-clinical and clinical studies) in developing a pivotal study design plan. Non-clinical testing (e.g., bench, cadaver, or animal) can often lead to an understanding of the mechanism of action and can provide basic safety information for those devices that may pose a risk to subjects. The exploratory stage of clinical device development (first-in-human and feasibility studies) is intended to allow for any iterative improvement of the design of the device, advance the understanding of how the device works and its safety, and to set the stage for the pivotal study. Thorough and complete evaluation of the device during the exploratory stage results in a better understanding of the device and how it is expected to perform. This understanding can help to confirm that the intended use of the device will be aligned with sponsor expectations, and can help with the selection of an appropriate pivotal study design. A robust exploratory stage should also bring the device as close as possible to the form that will be used both in the pivotal trial and in the commercial market. This reduces the likelihood that the pivotal study will need to be altered due to unexpected results, which is an important consideration, since altering an ongoing pivotal study can increase cost, time, and patient resources, and might invalidate the study or lead to its abandonment. For diagnostic devices, analytical validation of the device to establish performance characteristics such as analytical specificity, precision (repeatability/reproducibility), and limit of detection are often part of the exploratory stage. In addition, for such devices, the exploratory stage may be used to develop an algorithm, determine the threshold(s) for clinical decisions, or develop the version of the device to be used in the clinical study. For both in vivo and in vitro diagnostic devices, results from early clinical studies may prompt device modifications and thus necessitate additional small studies in humans or with specimens from humans. Exploratory studies may continue even as the pivotal stage of clinical device development gets underway. For example, FDA may require continued animal testing of implanted devices at 6 months, 2 years and 3 years after implant. While the pivotal study might be allowed to begin after the six month data are available, additional data may also need to be collected. For example, additional animal testing might be required if pediatric use is intended. For in vitro diagnostic devices, it is not uncommon for stability testing of the device (e.g., for shelf life) to continue while (or even after) conducting the pivotal study. This is what I’ve been arguing for a couple of years, now. If you want to test a medical device very well, then you have to test it in an exploratory way. This prepares the way for what the FDA here calls the “pivotal study”, which in software terms is basically a scripted demonstration of the product. Yes, the FDA says, earlier in this guidance document, that it is intended to apply to clinical studies, not necessarily bench testing. But look at the reasoning: this exact reasoning does apply to software development. You might even say it is advocating an agile approach to product design. Adam Goucher noticed that I recently laid a curse upon commercial test tool vendors (with the exception of Hexawise, Blueberry Consultants, and Atlassian). He wondered to me how a tool vendor might avoid my curse. Any vendor who wants me to pay for every machine I use their tool upon. Guys, the nature of testing is that I need to work with a lot of machines. Sell me the tool for whatever you want to charge, but you are harming my testing by putting obstacles between me and my test lab. Any vendor that sell tools conceived and designed by a goddamn developer who hates to goddamn test. How do I know about the developer of a test tool? Well, when I’m looking at a tool and I find myself asking “Have these vendor bozos ever actually had to test something in their lives? Did they actually want a tool like this to help them? I bet this tool will triple the amount of time and energy I have to put into testing, and make me hate every minute of it” then I begin to suspect there are no great lovers of testing in the house. This was my experience when I worked with Rational Test Manager , in 2001. I met the designer of that tool: a kid barely out of MIT with no testing or test management experience who informed me that I, a Silicon Valley test management veteran, wasn’t qualified to criticize his design. 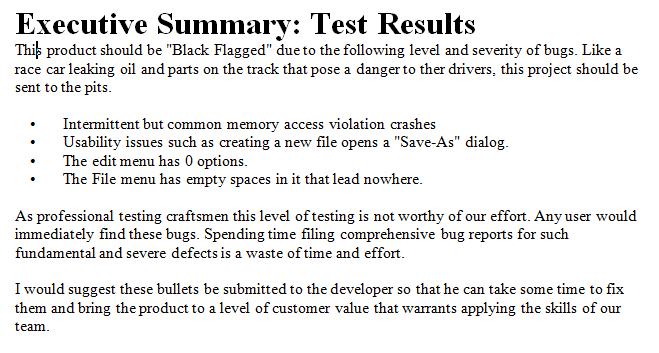 Any vendor selling me the opportunity, at great cost, to simulate a dim-witted test executioner. Most tool vendors don’t understand the difference between testing and checking, and they think what I want is a way to “test while I sleep.” Yes, I do want the ability to extend my power as a tester, but that doesn’t mean I’m happy to continually tweak and maintain a brittle set of checks that have weak oracles and weak coverage. Any vendor who designs tools by guessing what will impress top managers in large companies who know nothing about testing. In other words: tools to support ceremonial software testing. Cem and I once got a breathless briefing about a “risk-based test management” tool from Compuware. Cem left the meeting early, in disgust. I lingered and tried to tell them why their tool was worthless. (Have you ever said that to someone, and they reacted by saying “I know it’s not perfect” and you replied by saying “Yes, it’s not perfect. I said it’s worthless, therefore it would follow that it’s also not perfect. You could not pay me to use this tool. This tool further erodes my faith in the American public education system, and by extension the American experiment itself. I’m saying that you just ruined America with your stupid stupid tool. 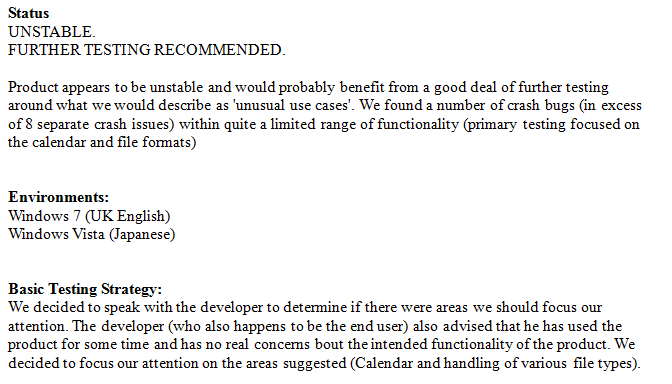 So yeah, it’s not perfect.”) I think what bugged Cem and me the most is that these guys were happy to get our endorsement, if we wanted to give it, but they were not at all interested in our advice about how the tool could be re-designed into being a genuine risk-based testing tool. Ugh, marketers. Vendors who want to sell me a tool that I can code up in Perl in a day. I don’t see the value of Cucumber. I don’t need FIT (although to his credit, the creator of FIT also doesn’t see the big deal of FIT). But if I did want something like that, it’s no big deal to write a tool in Perl. And both of those tools require that you write code, anyway. They are not tools that take coding out of our hands. So why not DIY? 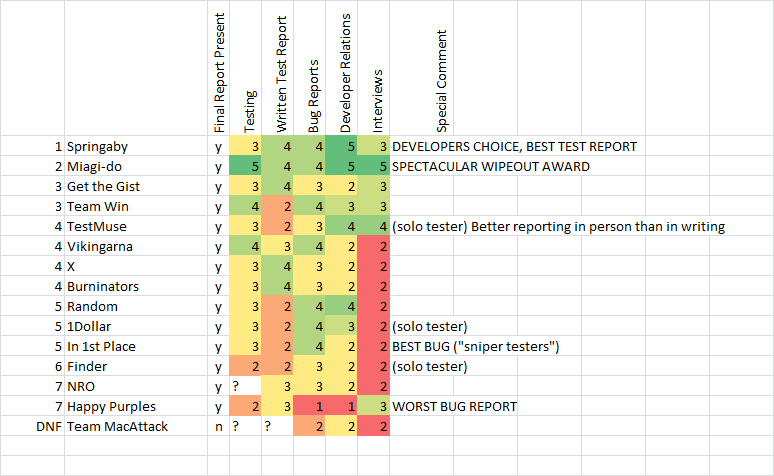 Vendors who care what working testers think of their tools and make changes to impress them. Blueberry, Hexawise, and Sirius Software have all done that. Vendors who have tools that give me vast new powers. I love the idea of virtual test labs. VMWare, for instance. Vendors who don’t shackle me to restrictive licenses. I love ActivePerl, which I can use all over the place. And I happily pay for things like their development kit. Vendors who enjoy testing. Justin Hunter, of Hexawise, is like that. He’s the only vendor speaking at CAST, this year, you know. My brother and I are instituting a new award at the CAST conference on Monday: The Bach Brothers Legion of Testing Merit. We will give this award periodically in recognition of certain testers who, we feel, deserve to be famous, but aren’t yet internationally recognized in the way they should be. The first four on this list are the founders of Weekend Testers which is a grassroots testing professionalism phenomenon. It is non-commercial, and in most respects is completely out of step with the Indian testing industry. The people who participate in it are going against the flow and ignoring the typical reward structures. Contrary to the trend of commercialized efforts at “testing professionalism”, such as ISEB and ISTQB, these people are actually doing the Weekend Testers not for glory or money or to maximize the chance they will be hired into safe boring job, but rather to achieve personal excellence in their craft. We’re fortunate to have Ajay speaking at CAST, this year. Pradeep was invited to speak as well, but he couldn’t make it. Pradeep Soundararajan is being given the award because, as far as Jon and I can tell, he has nearly single-handedly inspired the Context-Driven testing movement (in other words, the skilled testing culture) in India. The Weekend Tester founders credit him with inspiring them. Yes, there are other voices out there, too (Shrini Kulkarni and Meeta Prakash for instance). What makes Pradeep special is that he has suffered for his cause, enduring long periods out of work because he refused to do bad testing. I wish I could say there was a large cash prize that goes with these awards, but at least there is honor. Jonathan Bach and James Bach honor them! Now, go and save India, guys.